Citizen TV’s Rauka Show has lost one of its beloved presenter. Enid Moraa, a lady who hosted the show for five years handed her resignation making last Sunday her final show. The presenter took to social media to thank her fans for the support during her emotional exit. https://www.instagram.com/p/BuQNAvyB1Ae/ “Right from the beginning I have seen Enid grow. She has stood stable even in the most unstable times,” her mother said. “It has been an amazing 5 years with @EnidMoraa . It’s Enid’s farewell and we are extremely grateful to have had her on the show these past years. What would you like to say to @EnidMoraa ?” said Citizen TV on Twitter. Future plans On social media, Enid simply captioned “Still cannot believe it, five years,” while announcing her exit. The popular presenter didn’t share her future plans or where she might be headed. 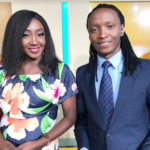 The post Rauka host Enid Moraa has quit the show appeared first on Ghafla! Kenya.